Axiom Verge has been a labor of love for Tom Happ since he began the project in 2010, with the final product hitting Steam and PSN last year... and now the award-winning game is branching out to new platforms. 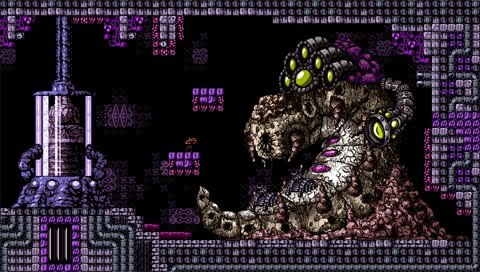 Later this year, the game will be coming to Xbox One and Wii U.
Axiom Verge is a metroidvania title with obvious influences pulled from the 8- and 16-bitters of yore, with Metroid-style exploration, Turrican-style gunplay, and some decidedly Abadox-style gore. The game offers a large world to explore, loads of upgradeable weapons, items, and powerups to be found by players who opt to probe every dark corner of the grotesque game world, and a number of pulse-pounding battles against hideous boss creatures. Then there's the glitch gun, offering a number of unusual possibilities to modify enemy behaviors and reach new areas.